Today marks the 100th anniversary of the Titanic hitting an iceberg south of Newfoundland. I went to see the film in IMAX 3D and it was even better than I had remembered it. The beautiful romance and tragic story of the ship was brought to life on the big screen for me, especially since I have only seen it on tiny tube TVs in the past. But what I really paid attention to this time around, (besides how perfect Leo was as Jack), were the exquisite turn of the century fashions in Titanic. Maybe I’m a sucker for period flicks, but there is something so beautiful about Edwardian fashion. It had all the elegance and pomp of Victorian styles, while still showcasing the female figure without hoops and petticoats. Ladies wore large hats with feathers that were works of art (think Eliza Doolittle). 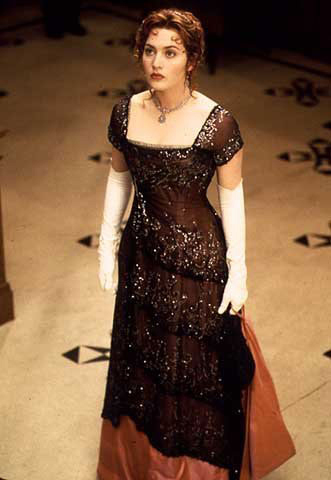 Who could forget the first look Rose wore while embarking on the ship? One of the most gorgeous styles to come from this era was the emergence of the Empire waist dress. Younger ladies would wear these slim dresses over their corseted bodies (to keep the slender look), with narrow skirts. Influenced by French couturiers like Paul Poiret, this new silhouette brought ladies’ fashion into the next century. Accessories were so important, and the ladies aboard the Titanic would be decked out in feathers, turbans, long white gloves, and most importantly, jewels. Oh and if you’re a die-hard Titanic fan like me, you can get yourself your very own Heart of the Ocean. Available from numerous sellers on eBay. Titanic fever has been sweeping over the world as people remember the sinking of the unsinkable ship, 100 years ago today. Costume Studies students at Dalhousie University put on a fashion show commemorating the lavish styles of the RMS Titanic. It’s fitting that Dal of all schools did this, since Halifax was the closest port city for any survivors left on board. If you don’t feel like crying your eyes out again, why not celebrate the anniversary by having a Titanic-themed party and wear vintage evening gowns while sipping on Gin & Titonics? Natalie Ast is a Toronto-based lawyer and loves to share her personal style and travel guides with an elevated, professional twist.